I don’t normally make tiny things. I don’t collect tiny things, either. That’s just me.Â Today, however, I decided that I needed a butterfly for the elephant I designed for my book project. I went to great lengths to make my elephant’s skin dry and cracked looking, and It will soon be painted all gray. 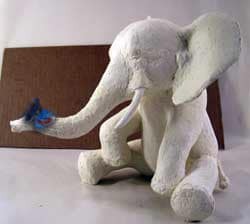 I think the pachyderm needs some color and softness for contrast, so I made the tiny blue butterfly shown above. It will soon be sitting on Elephant’s trunk, unless it seems just too cutesy. We’ll see. Since the little butterfly came out OK, I thought youÂ might enjoy seeing how easy it is to make one. I don’t know exactly what one would do with the little insects — although it would be fun to put an entire “collection” of rare species in a deep frame, (no net required). Or they could be hung on a mobile — but not within reach of a baby, since they aren’t edible. 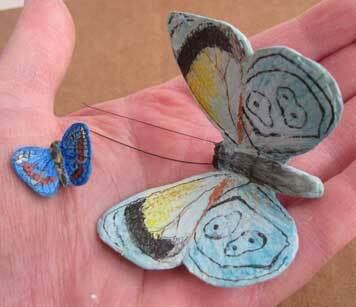 The butterflies are made with the new paper mache recipe (click here for details). You only need a small amount per bug, so one recipe will make lots. Like may be 50… Be sure to bookmark this page so you can find it after you’ve made a larger sculpture and have a little bit of clay left over. Or invite some friends over for a butterfly-making party. Step 1: Make up a quart of paper mache clay. Then find a photo of a real butterfly, or make one up from your imagination. 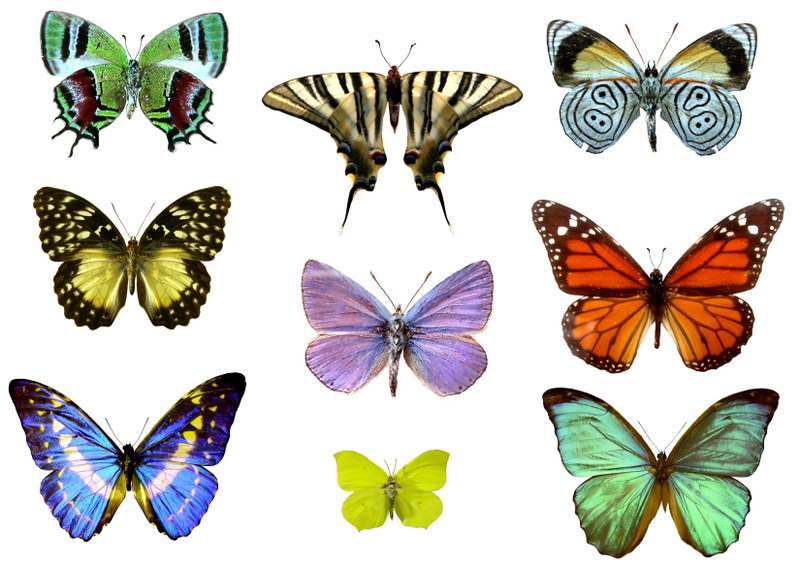 You can use one of the butterflies below, if one appeals to you. (Click on the image to see it full sized. It should open in a new window.) The butterflies with thin extensions on their wings will be more challenging than the one I picked, at top right in the image below. Step 2: Draw your chosen butterfly on poster board or heavy drawing paper. As you can see below, I “cheated” and printed the photo of my butterfly, then cut it out and traced around it on light card stock. 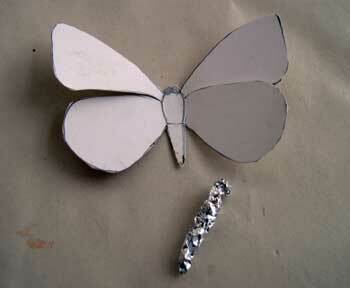 Step 3: Cut out your butterfly, and bend the wings upward slightly. Butterflies rest with their wings up, moths rest with the wings horizontal. (a Sphinx moth would be a nice project, wouldn’t it?). Then make a very thin “body” out of aluminum foil. 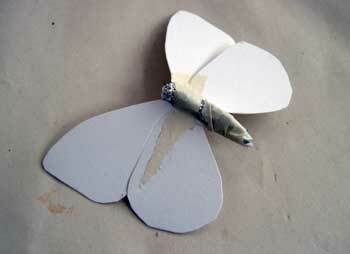 Step 4: Use thin strips of masking tape to attach the body to the underside of your paper butterfly. 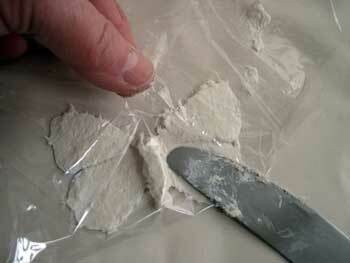 You will need to cover the aluminum foil entirely with masking tape, so the paper mache clay will stick. Step 5: Place your butterfly upside down on a piece of plastic wrap. 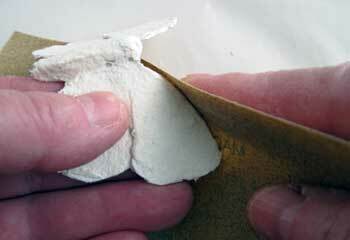 Then spread a small amount of paper mache clay onto the wings with the side of a knife. You want the clay to be really thin. It will spread over the edges of the wings, but don’t worry about it. We’ll remove the extra bits later. Cover the body with a thin layer of clay, too. 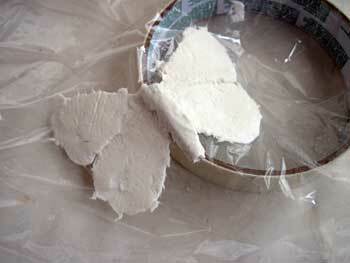 Step 6: Now fold some of the plastic wrap over the clay. You can smooth out the clay on the wings and body by rubbing over the plastic wrap gently with the flat part of your knife or a finger. If you make the clay smooth now, you will have less sanding to do later. Step 7: Now let your butterfly’s wings and body dry. You will need to rest it on the edge of something that will allow the wings to stay in the correct position. I used an old roll of masking tape to hold mine while it dried. 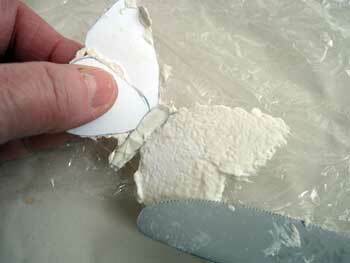 Since the clay is very thin, it will dry quickly, especially if you put it near a heat register. 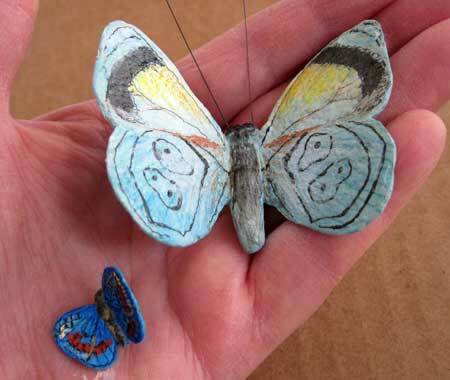 Step 8: As soon as the paper mache clay is dry, turn the butterfly over and apply a thin layer of clay to the top of the wings and body. Smooth it out, as you did before, and let it dry again. Step 9: Now remove the extra clay on the edges of your butterfly with a craft knife (carefully – those things are sharp) and then smooth the edges and flat part of the wings with sandpaper. 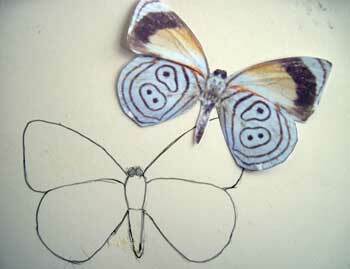 Note: I added antennae to my larger butterfly at the last minute, so it isn’t included in the how-to photos above. I didn’t intend to bother with them, but the butterfly seemed weird without them. I stuck on two filaments from a nylon house-painting brush with a small dab of hot glue, and then covered the wax when it cooled with additional paper mache clay. If you figure out an easier way to add the antennae, please let us know. I didn’t do any legs, but that could be an interesting challenge. Hi Miki. I think that’s a great idea. If I made another one that’s exactly what I’d do – in fact, I don’t know why I didn’t do it the first time. I’d use two thin wires or very stiff threads and attach them to the foil body with tape or hot glue. Then I’d add the paper mache clay. 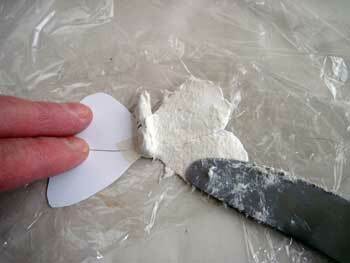 And I’d use less flour in the clay than I did for this one, just to make easier to spread very thin. I hope you’ll show us your butterfly when it’s done! Como siempre, excelente sus explicaciones, mil gracias desde Cali Colombia S.A.
Hi, I was wondering how you made the elephant? I really want to try this idea, but I want to use chicken wire to make the outline for the paper mache. I do it know or understand how to do it, I was hoping you could give me a step by step? I think you found the elephant video on the other page. I don’t personally use chicken wire, but I know a lot of people like it. I forgot to also add, very inspiring. Please help….I used th regular paper mache recipe (flour&water, some salt),,, on just the poster board : no newspaper was used. My problem is I love how the butterfly dried, but the wing by th body is cracking…its a little flimsy. I really want to salvage this (my 2nd attempt.., my 1st was too small and the wing tore off….that’s why I made this one bigger (9″wide x 6″ long)) Can I add super glue this or add the paper mache clay on top of it? ;How can I keep it from crumpling? I am three years too late. Now I have to add butterflies to my list. This is a photo of what I now call a bug but was supposed to be a butterfly. I used wire mesh for the wings (which made them too thick, but it might be good for a butterfly a meter wide). The body is aluminum foil, and the legs have wire that go into the aluminum foil on one end and the other end is attached to the wire mesh that I also used for the lily pads. The lily stem is made up of 5 wires that criss-cross the lily and then down the stem. The lily may fall over someday, but I don’t think the bug is going anywhere. I love the idea of using paint brush bristles for the antannae. Mine were wires and were also too thick. Anyway, this is a great site for ideas and butterflies are going on my list – your way! Thanks. Morgan, is there some rule that says you have to use computer paper? I think using a sheet of poster board would be much easier,and would be much stronger, too. You could paste several pieces of paper together, but the overlapped areas will bend in a different way than the other parts of the paper, so I’m not sure how it would work. That’s a project I’ve been wanting to try for a while too, sculptures on canvas. I did see a few pieces like it where the artist attached things to canvas and used a paper mache mixture but with fabric stiffener added in (starch I guess?). I didn’t get to see the backs of her canvases though, so I always have wondered if she added some kind of structure to the back to give the canvas anchoring points, at which point, why not use plywood instead of a canvas? Anyway, I’d love to hear how your project turns out. Hi! I just found your site and am totally blown away. Amazing! Thank you for sharing your skill and talent. I am working on VBS project. 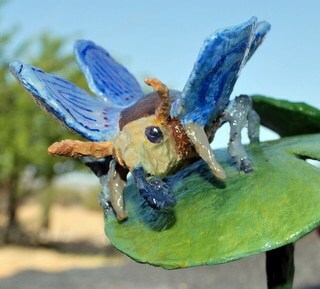 We are doing Bug Zone and I was planning on doing some butterflies, lady bugs, ants in paper mache. My question for you is, do you use forms or just the cardboard form I saw on one of the pages? I want to use your process because I will have a bunch of kids from teens to middle school age helping. I was planning on using the balloon method. I saw that if a thin layer is applied it dries faster. I am making critters that are approximately 2 feet in size. At least that is what I would like to do. Hi Ginger. You might want to take a look at some of the tutorials I have showing animal sculptures. You can see that I use the cardboard pattern along the center line of the sculptures, and then fill out the forms with crumpled paper and masking tape. 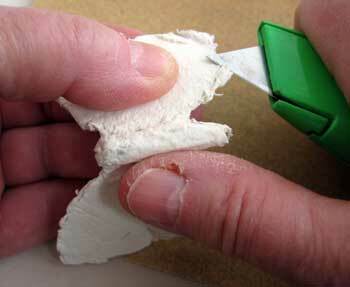 After that, you can use paper strips and paste or the paper mache clay. They will be inside a big American Legion building. The armature is the problem. I had a thought but didn’t carry through: A wire frame with aluminum foil wrapped around then the paper mache over it. I have plenty of wire (do garden topiary). I make some big balls covered with paper mache over balloons last year and they are still holding up, I decorated them like Christmas balls. It was fun and ever since I keep wanting to make more objects using paper mache. These are great and I love the techniques. I’m looking for a “how to” to make really large ones to decorate a big big building next spring. Have any ideas in that department? Will they be outside? If you make really big ones, perhaps cloth and wire butterflies would work better. Ideas, anyone? Thank you for this. 🙂 A few things that I found helpful were adding linseed oil to the completed product. Linseed oil is known to give a nice glossy look that exaggerates the hue of the colors well. Using a thin slate to smooth over the clay on the wings helped with the bumps for me. Also with drying the clay, it is best to use a hair dryer which works a lot quicker that leaving time to dry it, but by the window over night works nicely as well. I hope this helped, my results were excellent. My first attempt was redone because of the painting job, but the second butterfly went a lot smoother. Thanks, Felicia. Did you take photos so we can see your butterfly? I’d love to see how it came out. These are all terrific I love working with paper mache. Can any one tell me how to make a very big one to decorate a huge building for our craft show held in an American Legion Building? What to use for the frame and such. They will hang above so need to be large to be noticed. Time is such a difficult thing to estimate – especially for other people. I always tend to underestimate how long something will take to make. If by “huge” you mean up to 10 feet or more across, you’ll need some good reinforcing for the wings, and a really good, solid way to hang it so there are no accidents. For something like that in a public place, I’d ask an engineer or carpenter for advice. However, if they’re only two feet or so wide (still pretty big for a butterfly) you could get away with a heavy wire frame around the outside of the wings, and wire running down the center of the body with some strong attachment points. To keep your wings from warping, which is always a problem with larger flat surfaces when you add paper mache, you might want to check Tani’s suggestions, scroll down on this page, in her comments about her desktop junk drawer. She has a technique for preventing the piece from warping. Other than that, you can make your big butterflies exactly the same way the smaller ones were made on this page. Be sure to let us see them when they’re done.